This past spring Eta Lambda hosted our 8th annual Red Dress Gala at George Mason University. We invited over three hundred parents, alumnae, sisters and friends to join us for desserts, silent auction, and live auction. Through the generosity of our guests, we were able to raise over $15,000. In the Fall, we put on our annual "Eat Your Heart Out" and "King of Hearts" fundraisers, where your favorite fraternity men strut their stuff at GMU's premier all-male pageant! "Eat Your Heart Out" is a night of spicy wing eating and a salsa dancing competition where contestants are partnered with a sister of Alpha Phi to earn points the night prior to the pageant. Contestants then compete in the pageant, and battle for points in several rounds including: Question and Answer, Formal Wear, Spirit Wear, and Talent. Whoever ends up with the most points at the end of the night is crowned Alpha Phi's King of Hearts! The month of February was very busy for our chapter, as it is Heart Health Month. We aimed to spread awareness about the importance of Women's Heart Health on campus, as well as collect monetary donations to fight heart disease. We ended the month with a successful Teddy Bear Drive benefiting INOVA Fairfax Children's Hospital. The Mason community truly came together as we collected over one-hundred and fifty teddy bears from students and faculty to be donated to children struggling in the hospital. 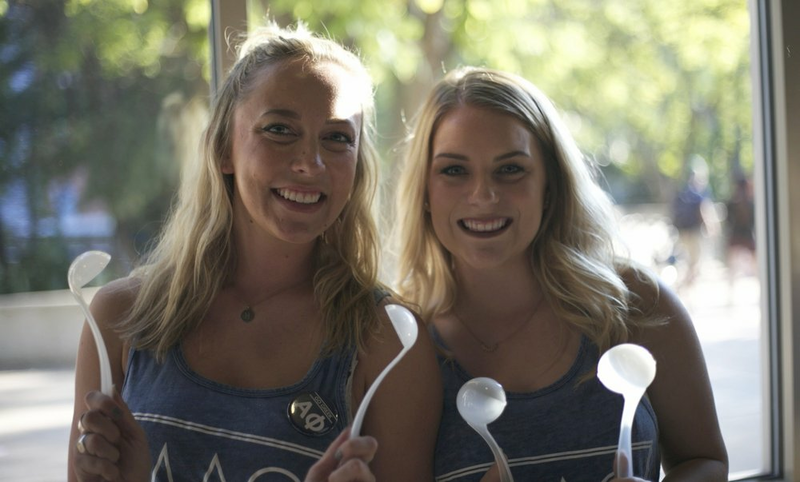 This past month we hosted our first annual Mac'N'Phis where we had over 200 students in attendance as well as raised Nine-Hundred dollars towards our foundation! The event was a fun way to start off the school year filled with mac'n'cheese and different eating competitions.